8:00 AM: English Sung Mass. 9:30 AM: Solemn Traditional Latin Mass with Blessing and Procession. 1:15 PM: Spanish Sung Mass. 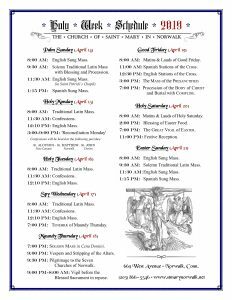 11:00 AM: Spanish Stations of the Cross. 12:30 PM: English Stations of the Cross. 9:30AM: Solemn Traditional Latin Mass. 11:30 AM: English Sung Mass. "Come and see": Experience the beauty and solemnity of the full traditional Holy Week. Audio: St. Mary's Schola Cantorum sings the Agnus Dei from William Rasar's Mass "Christe Jesu." Find out more about their debut CD.